Math Mammoth Add & Subtract 2-B: a self-teaching math book for second grade. Download and print. 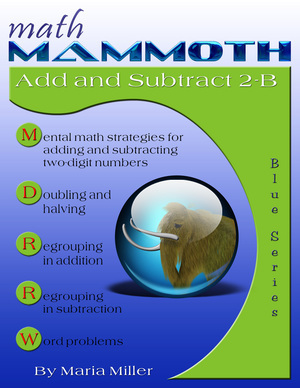 Math Mammoth Add & Subtract 2-B is a continuation to the book Math Mammoth Add & Subtract 2-A. The goal of this book is to study addition and subtraction within 0-100, both mentally and in columns, especially concentrating on regrouping in addition (carrying) and in subtraction (borrowing). Mental math is important because it builds number sense. This book includes many lessons that practice mental math. For example, the child practices adding and subtracting two-digit numbers when one of the numbers is a whole ten (problems such as 30 + 14, or 66 − 20). Also studied are problems such as 36 + 8 or 45 + 9. These problems use the idea of going over ten as in problems 6 + 8 and 5 + 9. The child knows that 6 + 8 fills the first ten and is four more than the ten. He/she will learn to use that fact when adding 36 + 8. The sum 36 + 8 fills the next whole ten (40), and is four more than that, or 44. Simultaneously with this, the child learns adding two-digit numbers in columns, and regrouping with tens, or "carrying," which is illustrated and explained in detail with the help of visual models. These visual models take the place of base-ten blocks or other manipulatives. You are welcome to use manipulatives to get the idea across, if you prefer. The main concept to understand is that 10 ones are regrouped to form a new ten, and this new ten is written using a little "1" in the tens column. The next lessons teach subtracting in columns. First we only deal with the easy problems where you don't need to regroup (borrow). Then the following lessons practice in detail the process of regrouping or borrowing. You can use either term with your child, or even choose not to use either if you feel it is confusing. You can alternatively use the phrase "breaking a ten into ten ones." First, the lesson Regrouping practices breaking down a ten into ten ones because we cannot subtract from the ones. It is crucial that the child understands what happens here. Otherwise, he/she might end up only memorizing the procedure, and will probably at some point misremember how it was done. That is why this lesson deals with the regrouping process in detail with plenty of visual exercises. If you notice that the child does not understand the concept of regrouping, he/she may need more practice with concrete manipulatives or visual exercises before proceeding. After learning regrouping, we practice mental subtraction in three separate lessons. One of them expounds on several methods for mental subtracting. Another is about Euclid's game—a fun game that also practices subtraction of two-digit numbers. The video below shows a similar idea as to what is in the book about regrouping (borrowing). Thank you SO much for the free download of Data & Graphs!! I had purchased several blue series books for my son but hadn't gotten that yet and it was exactly what I needed next. I've been so impressed with your curriculum. My son is autistic and non-speaking and your curriculum has been accessible to him. He does not do well with manipulatives like some other curricula use because he seems to think in numbers like I do. My son is 6 and using Place Value 1&2, Add/Subtract 2A and 2B right now. Great product! We'll continue buying once we finish up 2nd grade! 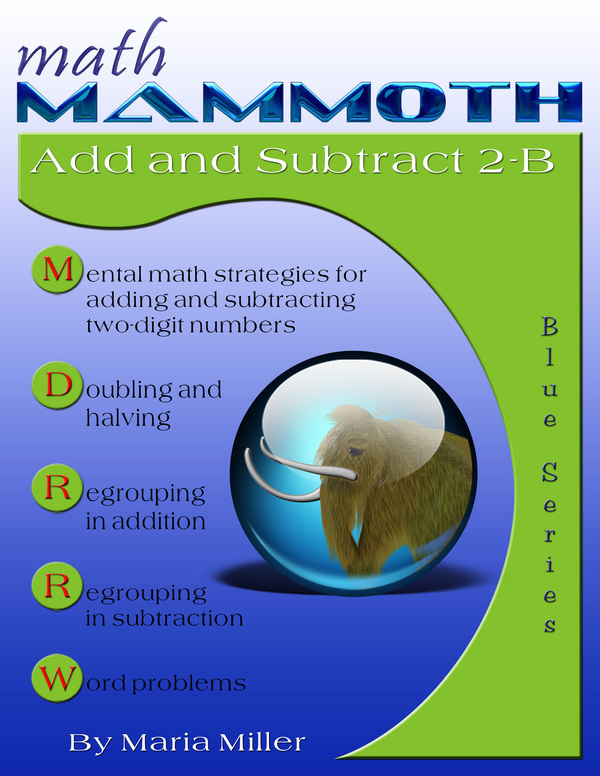 Math Mammoth Add & Subtract 2-A—a worktext about "easy" additions and subtractions within 0-100, memorizing the basic addition facts of single-digit numbers, and word problems (grades 1-2). Math Mammoth Add & Subtract 3—a worktext about adding and subtracting 3-digit numbers with regrouping and with mental math, estimation, and word problems (grades 2-3). Math Mammoth Place Value 3—a worktext about four-digit place value, adding & subtracting 4-digit numbers mentally, rounding, estimating, and order of operations (grade 3). Math Mammoth Clock—a worktext about reading the clock, elapsed time, and calendar (grades 1-3).